What a busy day our Reachers had today! To start off the day, while most of our students headed into their normal classes, our Life Sciences and Medicine students were getting ready to go spend their day in London! After a quick train ride there, they headed down to visit the Association of Anaesthetists and the Anaesthesia Museum. There they were able to attend a lecture given by a retired anaesthetist about the history and development of anaesthetics! 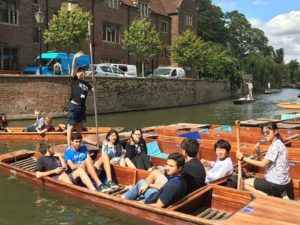 After finishing their classes our students who had stayed in Cambridge were able to give punting a try! In groups of five and six, our intrepid students sailed (well, punted to be exact) down the river Cam, past several bridges and colleges. One of those colleges was Trinity Hall where a number of our students are staying. In the evening, the usual dinner in students’ respective colleges was followed by a lecture titled “A Life of Flying”. This talk was given by a retired air force pilot, who later became a commercial airline pilot, and at one point also flew for the police! We were all able to learn all kinds of details about different aircrafts and piloting techniques, all while listening to anecdotes from his travels all over the world. But that is not all! Straight after the lecture ended, two spirits of Cambridge Past appeared in the lecture theatre, announcing the start of a Haunted Ghost Tour of the city! 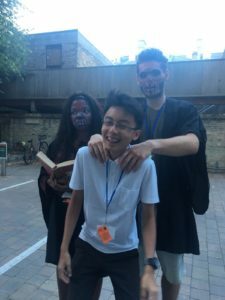 Our bravest students followed these spirits around the city, learning about tales of the most haunted locations of Cambridge and unknowingly being followed by some trickster ghosts..! Overall it was an exciting (and spooky) day, but also a long and busy one. So let’s hope our Reachers are able to get some rest tonight and are ready for another day full of learning, activities and fun tomorrow!